Our latest New Views exhibition features three artists whose work reflects on the world around them, both natural and human influenced, in dynamic and nuanced ways. 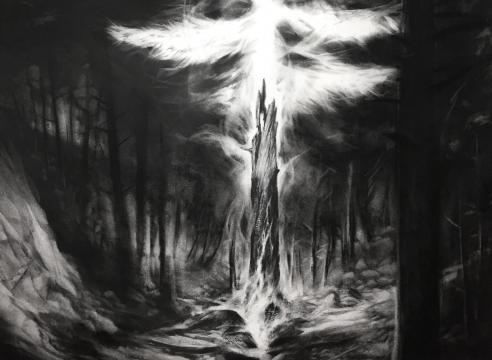 Amory Abbott, Bethany Hays, and Chris Russell are each meticulous in their attention to detail, using materials ranging from charcoal to watercolor to oil. 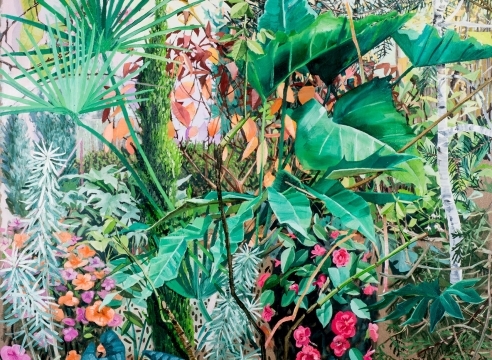 Whether looking at the density of a forested landscape (Russell), expanses of laundry that can overwhelm and redefine domestic spaces (Hays), or the darks and lights of natural space on the verge of possible destruction, each artist immerses him or herself in meticulous attention to details of shape, color, perspective and other aspects of their craft. Viewers will be enveloped in cascades of color, form, and pattern, which shape the world around us and inform these artists’ work to the smallest detail. Bethany Hays’ latest body of work continues an ongoing interest in domestic landscapes. With this show, she explores the visual complexity that can be found in real or imagined piles of laundry. She explains that, “I strive to make work that engages others with life situations like my own and stimulates discussion about the complexities of modern motherhood and cultural ideals of beauty and value.” The piles of laundry that often fill a busy household are recreated in an aesthetic context, where they become more controlled and ordered scenes, or snapshots of “transitory sculptures or mountainous landscapes.” As the work has evolved, it has become less about the laundry and more about the play of watercolor on paper, and the geologic constructions that result, or Erratics, as some of them are titled. Hays received a BA in studio art from The Evergreen State College, Olympia, WA, and her MFA from Portland State University, in Portland, OR. Her work has been exhibited in Portland and Salem, OR, and Olympia and Ellensburg, WA.